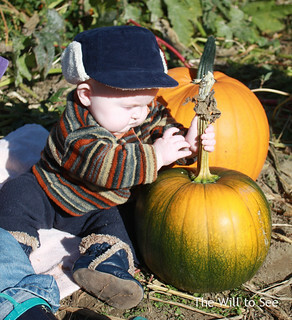 A sunny weekend day in October needs to be taken advantage of, so we headed out to our favorite local pumpkin patch. The weather report says it is supposed to start raining on Tuesday and not stop for a while, therefore we weren’t the only ones who had that idea. It was very busy at the Fall City Farm patch, which has some animals, a hay maze for the kids and amazing doughnuts, besides great pumpkins. The only thing they could use more of are carts, but we have long since learned to bring our own cart (or this year wheelbarrow) that way we don’t have to wait in the parking lot for someone to leave one behind. Jim and I had a bet on how many people would ask for our wheelbarrow on the way out. I lost. As we arrived, only 15 minutes after they opened, the parking lot was already almost full. After getting the boys loaded up (Jack in the wheelbarrow and Will in the front pack) we started our trek, which isn’t insignificant (no need to go to the gym today.) 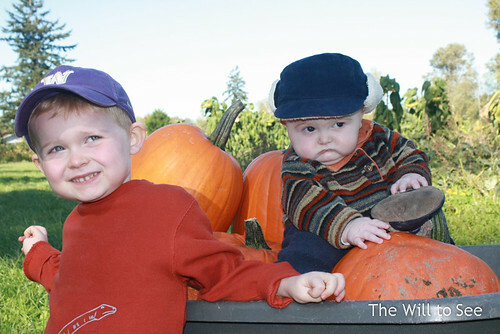 Once we traversed the farm we found a large group of pumpkins that had been pulled out of the field, great pumpkins, but we needed to search the field to make sure we had found our perfect pumpkins. 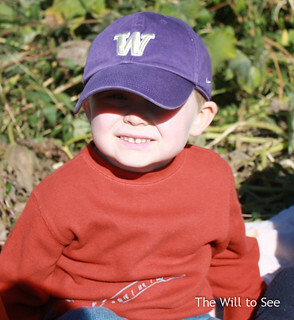 I headed out in the field with Will strapped to my chest to turn over, pull leaves off and unearth our pumpkins of choice. Now, if you think we are a family where each person picks one pumpkin you couldn’t be more wrong. We came home with 7 pumpkins (all carvable size) and the fight will be on to see who gets to carve which one (remember right now there are only 2 carvers.) After a couple of bad experiences of having our pumpkins stolen off of our porch, they are now safely on the back deck where we can spend each meal looking at them and deciding what will be carved into them. The fall leaves have started to turn and it couldn’t have been a prettier day. On our way out of the farm Jack did the hay maze while Will slept happily in the Ergo carrier. 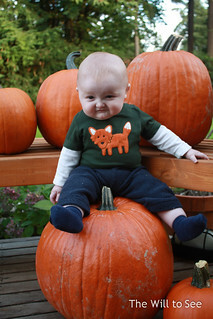 I think he enjoyed his first trip to the pumpkin patch. Next year will be even more fun with him walking through the field following his older brother searching for his perfect pumpkin.